A mixture of car clubs, semi private sites and European campers. Certain areas are prone to flooding and not normally used, but possibly for overspill. Entrance traffic very bad a peak times. We understand that the experience at Darion and Picinardiere is broadly similar to neighbouring Beausejour. We rate these sites slightly worse than the rest of Beausejour owing to their location further from the track and adjacent to a busy road. The rest of our review here is the same as for Beausejour. If you are okay with the distance walking issue, its normally easy to get tickets. Distance to the village - it's a massive walk. Don't underestimate this. The scale of the place and location means it even has its own tractor bus service to the entrance of the site. Be careful you know where the areas liable to flood are and don't accept a pitch there. You can find a aerial site map in our map room. A 5 minute drive (not during the race) brings you to an industrial estate close to the track at Mulsanne. It contains a drive through McDonalds and one of the finest hardware stores in the region - Le Roi Merlin. They sell tonnes of BBQs and outdoor items you will love! 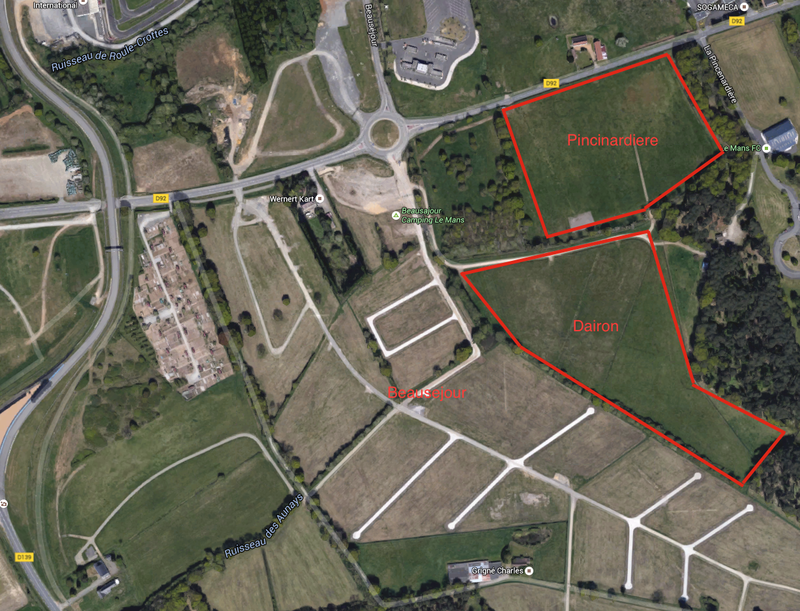 Both Picinardiere and Darion are additions to the BSJ complex of fields which the ACO leases from farmers to keep up with demand for campsite space. Beausejour is a huge grass pitch site, with all the roadways of compacted un-metalled sub-base and between pitch access on grass roadways. These roads in some places can get pretty beat up if the weather turns wet especially near the entrance area. The site has now been fenced off fully with all the entrance areas fully manned by security, who on arrival will fully check what contents you have in your car, this has cut down a lot on who can enter the site. Entrance to the site has been improved for 2015, The site now has TWO entrance laid out. Also at the entrance is the Ticket offices, security huts, medical centre and other administrative offices. Just past the entrance is a Bar and Kebab fast food area, which is always busy, and open very early to very late. Also in 2015 a bar has now appeared in the centre of the camp rough half way between TART and 6EURO camp areas. The toilet and shower blocks have improved over the last couple of years, with decent, though compact showers running hot water (till Sunday night), they are kept clean each day and restocked when needed, with the cleaning crews coming round a couple of times a day. The only issue is there is really enough blocks for the size of the site and at certain times of the day can get very busy. Near the entrance is the Speed Chills set up having a large fenced off area for their customer, other fenced off areas are set out for the Danish companies and and the village on the curves. Pitches are supposed to be the usual 7m x 5m (35m2), but they are not really marked out in any real way. 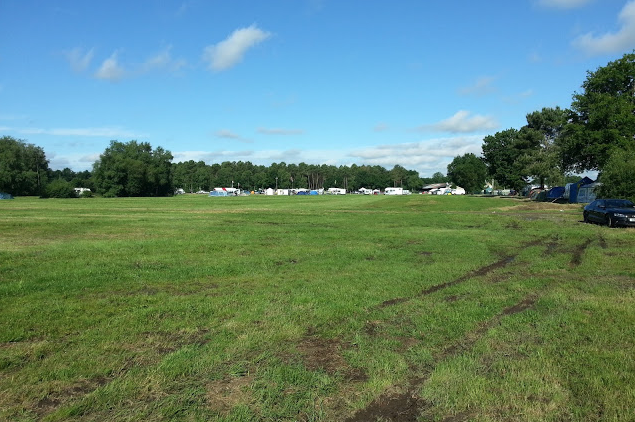 Larger pitches are 7m x 15m (105m2) and are in a designated area near the Speed Chills site. There are some areas which flood following heavy rain and this has increased somewhat with a lot of drainage ditches being filled in to increase the sites use. The worse areas are off towards the Porsche curves near the trees. From Friday onwards the site does get full and quickly so to get your best place you need to be there at the latest Thursday morning. The rubbish barrels (Fire pits) were removed in 2014 due to the large number of fires that appeared, especially on a Sunday night. Once piece of advice if you drive out in your vehicles on Friday make sure your back early as Chavvy Friday gets pretty bad on the roundabout by the entrance with the crowds hounding cars until they at least rev them before letting them through the melee.